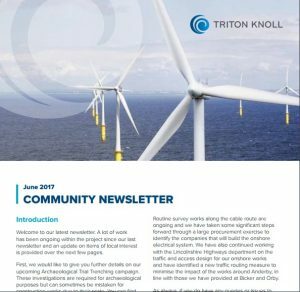 The latest Triton Knoll Community Newsletter is now available to view and download, bringing you all the latest news and information surrounding the development of the wind farm. Amongst the topics featured in this edition, are the forthcoming Archaeological Trial Trenching campaign (not to be mistaken for the start of construction works, which won’t happen for some time yet); Local Liaison Committees; Community Investment Fund consultation and traffic and access, with Lincolnshire Highways department. Triton Knoll features in the press, online and on social media. You can stay up-to-date with all things Triton Knoll here.